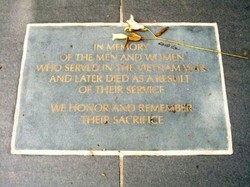 Over 58,000 men and women who served in the Vietnam War, died there. Their names are inscribed on the Vietnam Veterans Memorial Wall in Washington, DC. However, more of our military died after they returned home from the war. With both physical and psychological wounds, they suffered for some time before eventually passing on. The names of this latter group of service men & women are not eligible for placement on the Vietnam Veterans Memorial Wall, although their death resulted from their service. Yet they are still honored at the National Mall in Washington, DC with the "In Memory Plaque", and an event known as "In Memory Day". In Memory Day is held each June on the National Mall in Washington, D.C. It is sponsored by the Vietnam Veterans Memorial Fund, who are the founders of the Vietnam Veterans Memorial Wall. Aptly held in view of the "Wall", the ceremony is attended by the family and friends of those service people who died as a result of their service. In 2012, the year in which I attended, over 600 people participated in the In Memory Day event! At the beginning of the ceremony, the Honor Guard brings in the colors. There are flags for every branch of the service, plus the United States flag. The Star-Spangled Banner is sung, and the Pledge of Allegiance recited. While you have heard both of these many times, it is quite moving to experience them in this setting. Many war veterans are in the audience, and it brings tears to your eyes to see how patriotic they really are. After the Retiring of the Colors by the Armed Forces Color Guard, several speakers provide remarks about the honorees. While they may be political figures, they leave their politics behind while they speak. Each year since 1998, names of the veterans who have lost their lives as a result of their service in Vietnam are added to the In Memory Honor Roll. Yet, this is not the only time their names are mentioned. After the speakers have given their remarks, family members and friends of the veterans who were added in previous years are invited to the podium once again. Spouses, family members and friends of the fallen state the name and service of their loved ones. You can hear in the shakiness of their voices that they still grieve for their loved ones. Yet, you feel in your heart the love and the pride they have for those heroes who are gone. After the Benediction, the song Unsung Heroes by Navy veteran Chuck Price is played. In past years, Price played the song live. However, in 2012 he was unable to attend, so the song was pre-recorded. As the song continues, family & friends of the present year are invited to stand behind the tributes of their loved ones. It is a solemn moment; both tragic and wonderful at the same time. I have never felt so proud and so sad at the same time. As the music stops, the names begin to be read. Starting with the veteran who lost his life the longest time ago, family members state their loved one's name, relationship and military branch. By the time everyone's voice is heard, you will find tears are streaming down your cheeks. There is no way that you cannot be moved by this ceremony. After the final name is read, Taps is performed by the United States Marine Band. Such a mournful sound! The participants retrieve their loved one's tributes, and head to The Wall - the Vietnam Veterans Memorial. Leaving their memories along with their mementos, saying one more good-bye. It is difficult to describe the emotions you will experience at the In Memory Day event. Watch these short videos to see if they don't bring a tear to your eye. Do You Know Someone Who Died As A Result of The Vietnam War? It is my hope that you did not know anyone personally that should be remembered at the In Memory Day Event. However, if you do, I'd like to hear their story. If you have any comments you'd like to make about In Memory Day, or the other Vietnam Veterans Memorials, please post them in the comment section below. Vietnam Veterans Memorials in Washington, D.C.
Official website for the Vietnam Veterans of America. If you need help with any issues relating to service, this is a great place to begin. Kim, I'm so sorry to hear of the loss of your father! It is so tough to watch someone who suffers the effects of Agent Orange. It is such a shame he was unable to get the liver transplant in time. To have your dad honored at the "In Memory" event, you will need to contact the Vietnam Veterans Memorial Fund. Their website is http://www.vvmf.org/ . You will need a copy of his DD-214 to show his Vietnam service. These people are really kind, and will help you honor your dad in the best way possible. Try your best to go to the event. It will make you cry, but also make you really proud. I have been twice, and each time, it made me feel like I was doing the best I could do to honor not only my husband's military service, but his life as well. My dad died last Thursday. He is my hero. He served with the Third Marine Division as a rifleman in Con Thien. He was the only survivor in his group on three different occassions and was one of three that made it out alive on September 7, 1967. He received the purple heart and was honorably discharged as a Lance Corporal on January 1, 1968 after enduring multiple surgeries at the Great Lakes Naval Hospital and endless abuse from the public during his stay there. He suffered silently these past years with unspeakable horrors but never failed to be an amazing dad, strong, loving and selfless. He was receiving VA benefits from complications associated with Agent Orange. He was plagued with atrial fibrillation, cirrhosis of of the liver, diabetes and assorted other maladies attributed to AO. He was just accepted onto Vanderbilt's liver transplant list in October and was a favorable candidate. After going to Vandy for routine appointments last week, his decreased liver function caused his kidneys to fail and he was taken into ICU by ambulance and he never rebounded. I'd love to get him into the Memory Event. Thanks for whatever direction you can offer. That is truly a meaningful way to remember the heroes of the Vietnam war.